A long time ago I had a Cilician Armenian ally for my Mongol Conquest DBM army. I even wrote a Slingshot article about it. Of course, the lists changed and the ally was no longer allowed. So I sold off all of the infantry and all bar a few of the knights. Imagine my surprise when I noticed the other day, that the Armenians can act as allies under FOG. So I looked at the three elements I’d kept and decided I need to get my paint brush out again. Here are the results. I had nine figures already painted so I only needed to buy and paint three to complete a small FOG battle group. Or so I thought; if only life was so straightforward. Once I’d painted the four new figures I decided I didn’t like some of the colours I’d used on the old figures. So I repainted some surcoats. Then I decided to add another layered highlight to the older horses. Then I decide to add some flags. 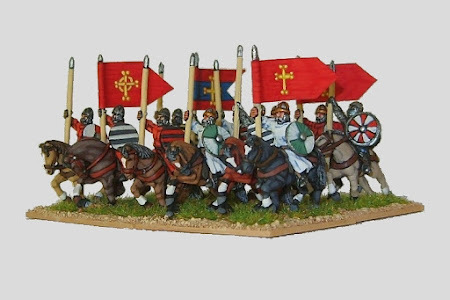 The flags are based on the set of speculative flags and banners for Cilician Armenia provided by Chris Brantley and are all hand painted. I won’t mention the problems I had with the varnishing except to say that a bit more re-painting took place. Needless to say a quick job turned into a frustrating and much longer project. In some ways it reminded me of a horrible DIY task. In the end I’m pleased with the battle group. Now I’ve got to do some infantry. They look really cool. Love the flags as well, nice one!! Nice. A good little grouping...and I too like the flags. Very nice. Good flags too.